The Youth demographic in Sub-Saharan Africa encounter digital advertisements more frequently on a daily basis than any other form of advertisement; Coca – Cola advertisements are the most memorable due to their creativity, this is according to a recent GeoPoll Straw Poll. In the first part of this series on advertising to youth in Africa, we focused on the rise in consumption of digital advertising among this demographic. We explored on the advertising call to action, as well as the role that online channels are playing in being a source of information for consumers in their buying process. In this second and final part of the series, we focus on advertisement recall as well as the most creative advertisements as voted by our panel of respondents of this straw poll. The aim was to determine how easily consumers recall advertisements they encounter on different media daily, which media channels they consume these ads from, and which advertisements they felt were very creatively done hence the recall factor. The insights from this survey are not representative of the total population in these countries, however, they do give us some valuable pointers on the consumption of advertising by the youth demographic. It also provides insights for marketers, media buying and creative agencies on how their target market is responding to their messaging. Advertisement recall measures a respondent’s recollection or recall of an advertisement. The respondent’s answers provide insight to the most memorable attribute of the advertisement. Generally, ad recall is requested immediately after the respondent views the advertisement. Recall is lessened over time. The GeoPoll audit retail service is one of the most effective ways of measuring ad recall. It is done using the mobile phone via sms as the respondent consumes the advert from whichever media. The advertisements with the highest ad recall among youth consumers across the multiple platforms included in the survey are by the Coca-Cola Company. Their TV advertisements enjoying the highest recall at 13%. 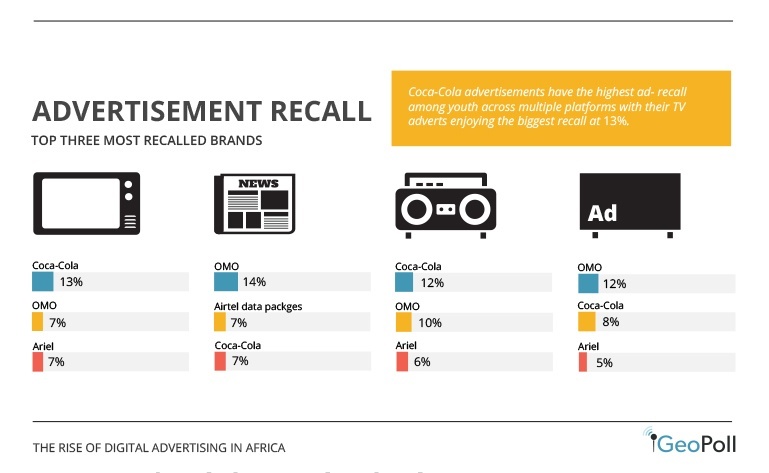 As we breakdown the advertisement recall by channel, the top 3 most recalled brands by youth consumers from TV advertisements were: Coca-Cola, Omo and Ariel. From the print adverts: Omo, Airtel data packages and Coca-Cola had the highest recall. From radio: Coca-Cola, Omo and Ariel reigned high. Finally; Omo, Coca-Cola and Ariel had the highest ad recall from their out of home advertising. Coca-Cola advertisements were picked as the most favorite among respondents across all media due to their creativity and ad-recall factor. Looking at advertisements in the respective media channels, the 3 most listed favorite TV adverts across respondents who consume TV are: 1) Coca-Cola at 11% 2)Nivea Personal Care (6%) and 3)Indomie Noodles and Omo at 2% each. From those who consumed print, most voted Nivea advertisements as leading in creativity, followed by Omo and Always. From radio, Coca-Cola advertisements lead closely followed by Nivea skin care; Tigo and Movit tie at number 3. Among the respondents who consumed internet, Coca-Cola was voted as number one, Nivea skin care and Tigo followed closely. Finally, from Out Of Home (OOH) advertisements, Nivea body lotion advertisements were voted as number one closely followed by Coca-Cola, Omo and Movit tie at number 3. The strive by marketers, creative agencies and media buying agencies to capture the attention of their target market in unique ways is greater now even as the consumer and media platforms become more segmented. Getting the consumer’s attention is not as easy now; the future promises some curveballs. Download the full infographic on Advertising to African Youth Consumers today!